Welcome to Australia’s Number ‘1’ Jet Fighter Operation, with the success of a good product recognition soon follows in the form of media, promotions, branding and of course our main goal the general public. International recognition of our premium product keeps our company strong and well driven for personal service. 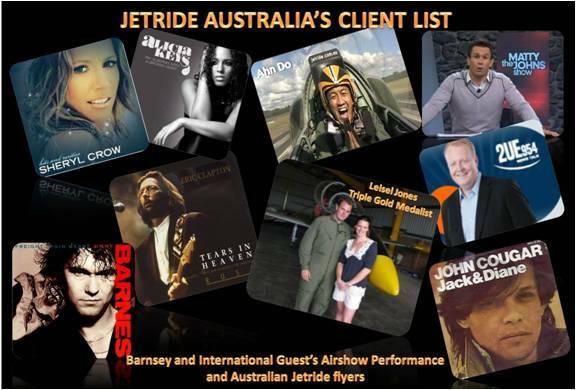 Flying airshow displays for VIP guests, also flying Australian famous personalities as listed on the picture to the right hand side of the page…. keep the International and local Guest coming to us!!. There is so much to see and do in the Hunter Valley Wine Country region of New South Wales, it is an ideal destination for a weekend escape or an extended holiday base. The Hunter Valley is within easy reach of the Sydney CBD – in less than 1.2 hours you can be deep within the lush valleys and rolling hills of one of Australia’s historic and best wine producing areas ,the vineyards in the Hunter valley is fast becoming Sydney’s new single day getaway destination. Pokolbin in the Hunter Valley is the adventure capital of N.S.W providing Jet Fighter Flights you can also Sky Dive, go Ballooning ,Helicopter Flights or even old Warbird Flights and much more. 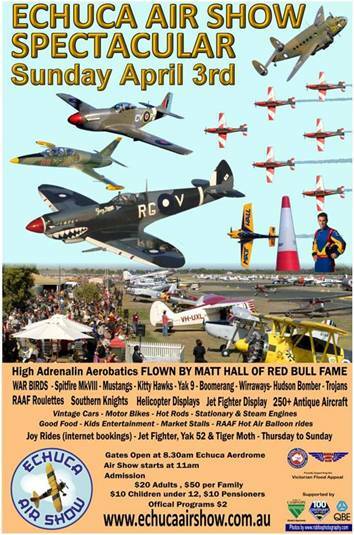 Jet Flight Australia has excepted the invitation to participate in one of Australia’s best regional airshows in the border town of Echuca on April the 3rd. Captain Mark Pracy will showcase the L-39 Albatros and display the capabilities of our beautiful Jet Fighter to the airshow fans of Echuca. 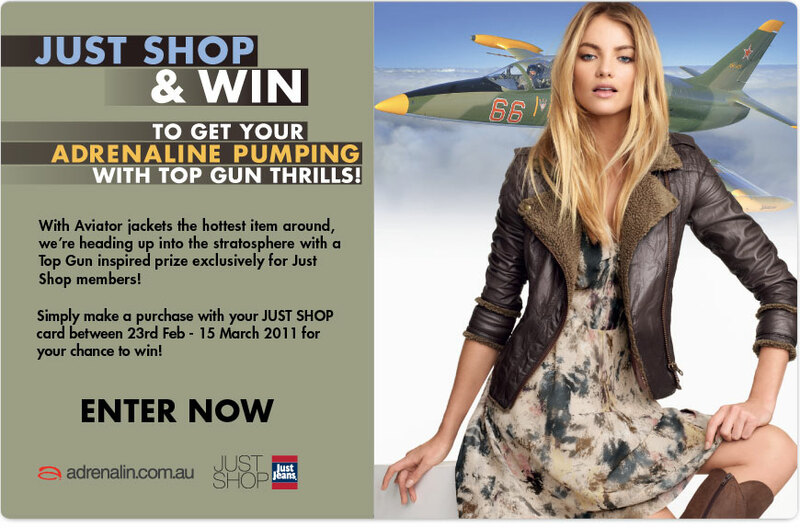 One of the latest promotions for our L-39 Jet Fighter is the Just Jeans promotion conducted by our leading adventure sales team Adrenalin,who promote the Jet in line with a clothing Style as featured in the advert, and the response was amazing. On the international front the Jet Fighter concept has reached China with a delegation experiencing the ride of a lifetime, and give the thumbs up approval of our Australian hospitality and world renowned product . 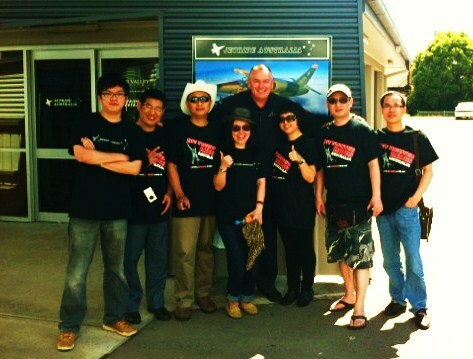 Jet Flight Australia has made many International guests the proud crew member of our Jet Fighter Team. Jet Flight has entered the International stage by organising a team of dedicated people to participate in the Fastest Race on Earth !! 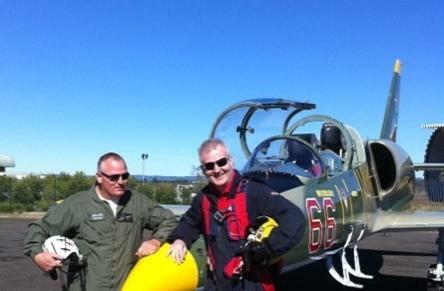 Our team has purchased another L-39 Albatros Jet Fighter to fulfill this dream. Basing the new Jet in the USA for the “ULTIMATE ” motor sport in Nevada. The 2011 Reno Air Race will be taking place in mid September and Jet Flight Australia will be participating in the Fastest Motor Sport on Earth, with speeds in excess of 500 MPH, 20 metres off the ground. The race attracts the best of the best in International aviation. To view the race website link, click on the Pracy Racing image below. Wish us luck !! Five times basket ball Aussie Olympian,, Andrew Gaze experienced 5 times the force of gravity on Australia’s favorite Jet Fighter Ride. Captain Mark Pracy took Andrew through the safety brief and then strapped in for a ride of a lifetime, looping and rolling though the skies of the Hunter Valley. The experience left Andrew with a new found outlook on the life, the Olympics was a walk in the park compared to flying in a Fighter Jet and it beats being in a simulator. That’s an easy comment from the man who has the most points scored in basket ball Olympic history. What a remarkable Athlete. © 2015 Jet Ride. All Rights Reserved.